Stainless Steel Muffler Manufacturers - What To Choose? 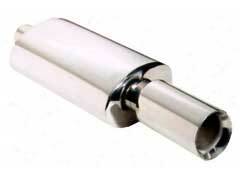 A stainless steel muffler looks sharp and can offer many benefits. For one, these come with chambers that can reduce sound thereby giving drivers a quiet and smooth ride. They can also lead to better fuel efficiency as a stainless steel muffler can reduce engine heat and wear. Like with any product the key is to find a quality manufacturer. After investigating all the options available these two companies stand out. If you buy a Flowmaster muffler you can be sure you’ll receive the best in innovative features and durable construction. Their design incorporates Delta Flow technology to increase horsepower and torque in engines while reducing fuel consumption. They have an outstanding selection of models ranging from their 60-series which is perfect for sedans whereas their 50 series big block is best for large SUV’s and full size trucks. Another brand worth checking out is Magnaflow. A Magnaflow muffler uses a unique design to offer drivers superior performance. These are made with 100% stainless steel, which means this muffler will hold up in even the toughest conditions. Further, the stainless steel mesh can withstand high temperatures and can also reduce sound, which will leave you with a quiet and smooth ride. When considering muffler prices, both are expensive, but they also offer much in return value in better horsepower and fuel efficiency. There isn’t much separating the two as they are both excellent products and both companies stand behind their items with lifetime warranties. Normally this is where I would tell you one brand is better than the other. Honestly, here I cannot. What I can recommend is if you are in the market for a stainless steel muffler these are the two companies you’ll want to look buy from.